I have a confession to make – riding Drishi scares the crap out of me. Not because of him – he is awesome – but because of me. When I get on him I realize how my first reaction to a situation is fear. I’m scared he’ll take off, I’m scared he’ll buck me off, I’m scared I’ll just fall off, I’m scared he’ll trip and we will crash… basically I’m scared of getting hurt. Just like in the rest of my life – I’m scared of getting hurt. Drishti is awesome, he is exactly what I prayed for even though I didn’t know all the details when I was doing the praying. I prayed for heaven to give me a big, beautiful horse who was still green enough I could put some schooling time on – one that I could ride out in the fields here but could also teach some things to. He is green and certainly could do with some schooling lessons… but make no mistake, the one doing the teaching here is Drishti. A few years ago when I was in the pits of my dark night of the soul, my anxiety was so bad that I could barely function. Just doing the bare minimum to get through the day took all the bravery and strength I had and I think it’s important for me to remember that as I think of how I’m learning to face fears while riding. I have already experienced all the big things I was afraid could happen in my life in the last couple of years, so I find it interesting that these smaller fears can be so powerful. But life happens in the small moments and I want to make sure mine are filled with hope and peace instead of fear. I was riding today and poor Drishti was upset. His friends are gone for the day and he was feeling quite sorry for himself being all alone. I also haven’t ridden him in a week and what he really wanted to do was go for a big long gallop across the field (not happening). I rode him around the field and really paid attention to how he was. He was looking at everything – cows over there, dogs underfoot, tractor over here… lots to look at. But he just kept walking along – he’s pretty much the same all the time. Me on the other hand was more like will he spook at the tractor? what if when he puts his head down to rub his leg he then grabs the bit and takes off? (thanks to some awesome childhood ponies this fear is real) What if he bolts back to the barn? Meanwhile Drishti is still walking along looking at the world. It got me thinking about trust. The two of us are working on building an extremely close relationship that has to be built on trust. Does he trust me? I think so. Do I trust him? Apparently not so much. Have I ever done anything to betray his trust? Not really, but I hold onto his mouth a lot more than I should afraid he’ll bolt which shows a lack of trust. Has he ever done anything to betray mine? Besides that one time when he took off with a couple of happy bucks? No. And I totally got the happy bucks – he’s a horse, he was having fun, it was a beautiful spring day. The trust issue is mine. 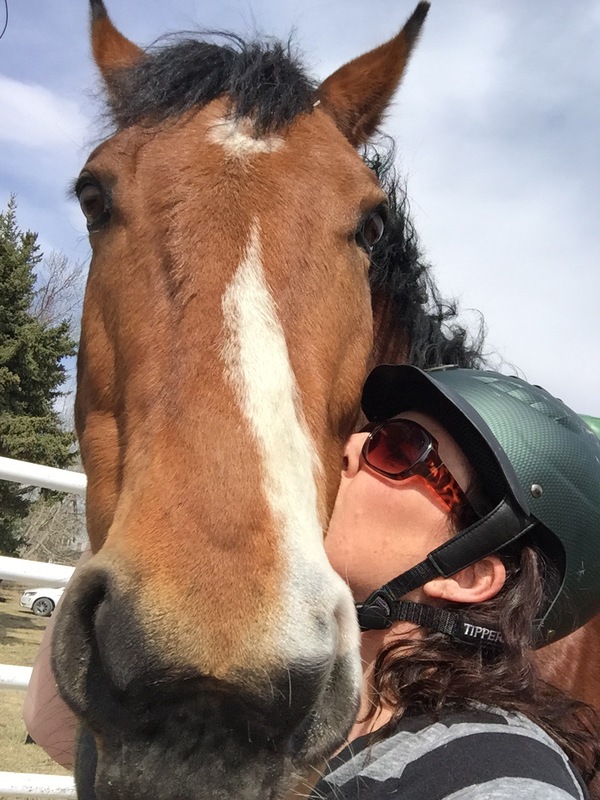 What I love about this horse – aside from the fact that he’s an amazing gift from heaven, that my soul is complete now that I have a horse again, and that he’s so incredibly cute – is that he’s teaching me how to trust completely and to let go of my fear. Learning how to reprogram how I approach my life and relationships – this is happiness. I love this guy. I’ve been redefining happiness over the last few days with the understanding that I am now at the place that I need to be searching for ways to have happiness part of my life all the time and for no reason at all – just to have happiness be my way of living in every moment. I started this blog needing to find one happy moment in every day to give myself hope that I could have more happy moments. I think I’m ready for more – more hope, more happiness, more love. I think this story is so beautiful. I am happy you have this gift and can work through these emotions and issues. What good lessons you are learning from such a comforting creature.